The Textorcist is a bullet hell typing game. That’s write! Ahh… right. Not only do you need to dodge dozens of incoming projectiles with pin-point accuracy, but you also need to type in an incantation to exorcise the demon shooting them at you; at the same time. You play as Ray Bibbia, a private exorcist with mad typing skills. The city of Rome is under a demonic threat, and it’s up to you to defeat the forces of darkness and face your own sinful past. You’ll face Goth maids, gun-totting gangsters and perhaps even the Pope himself in your journey across the city. By the end, you will have uncovered a sinister plot to topple The Holy Church. However, it seems like the demons are getting help from someone within the organization – someone hoping to use the church’s unlimited control to conquer the entire city. 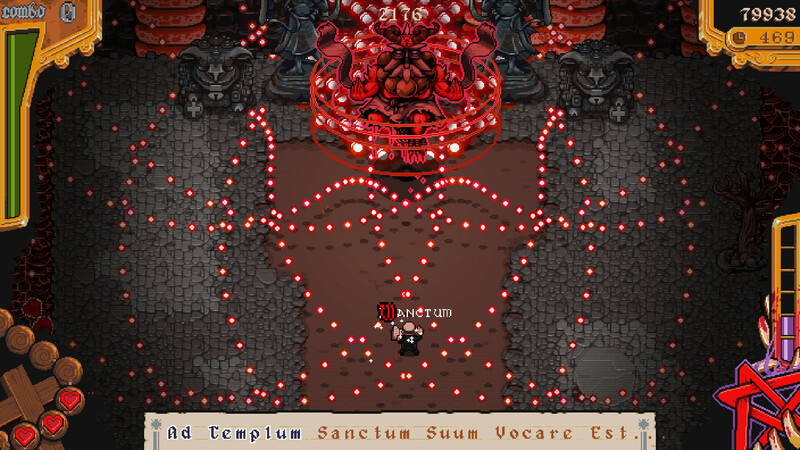 The Textorcist will feature ten intense boss fights where you’ll need to avoid tons of bullets, deal with toxic barf (of course), defuse bombs and even sing into a mic in a heavy metal show. The game promises more twists in later battles, so you better be ready for anything. The game also has online leaderboards where you can share you’re amazing exorcising scores. Manage to go through a boss fight with getting hit or making a typo, and you’ll perform a “perfect exorcism.” I’m not sure what it actually means, but it seems like something that will look great on those online leaderboards. Oh, and if typing isn’t your thing, there’s a “rookie mode” you can play using a controller. Or, you know, get someone else to type in the words while you frantically avoid demonic bullets and barf. The Textorcist is coming out on February 14, Valentine’s Day, on Steam. Because nothing says “love” like frantic typing and frequent cursing. Some of our posts include links to online retail stores. We get a small cut if you buy something through one of our links. Don't worry, it doesn't cost you anything extra. As Chief Editor and co-founder, Guy is responsible for pretty much everything that goes up on the site. He is a huge fan of survival horror, point-and-click adventure titles and everything with a good story. He prefers to play games alone, in the dark - as nature intended.